Bring dawn all ingredients and reach 90000 points to complete the level. 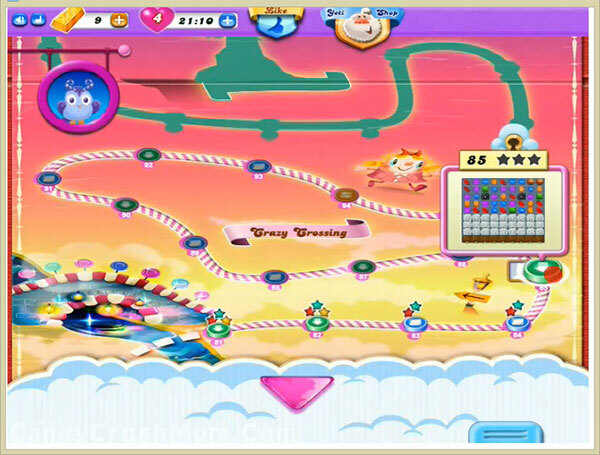 This is again hard level and have 9 chocolates plus 27 meringue blocks that you need to break first. To reach requirement within all moves you must break all chocolates so they wont increase later and ingredients wont stuck on it. Try to make special candies like colorbomb and combine with striped candy or other special candy to take ingredients to the bottom. We completed this level with 220000 score and luckily got five colorbombs that help to reach requirement within last move and got three star score.